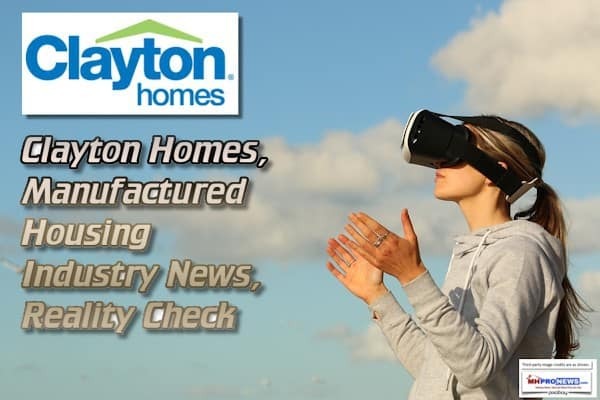 Clayton Homes made the news several times in recent days. As a heads up to readers, this mentions legislation, but that isn’t the headline topic. The example that follows exemplifies a reality check that will tee up an “Aha! Moment” for many. The subjects Clayton Homes has been included in mainstream media reports included such topics as their support for the amendment proposed to S. 2155. That amendment is based upon the Mortgage Loan Originator (MLO) rule proposal found in the Preserving Access to Manufactured Housing Act. That’s fine. The point? What’s the Reality Check? can get into the news virtually any time they want to do so. 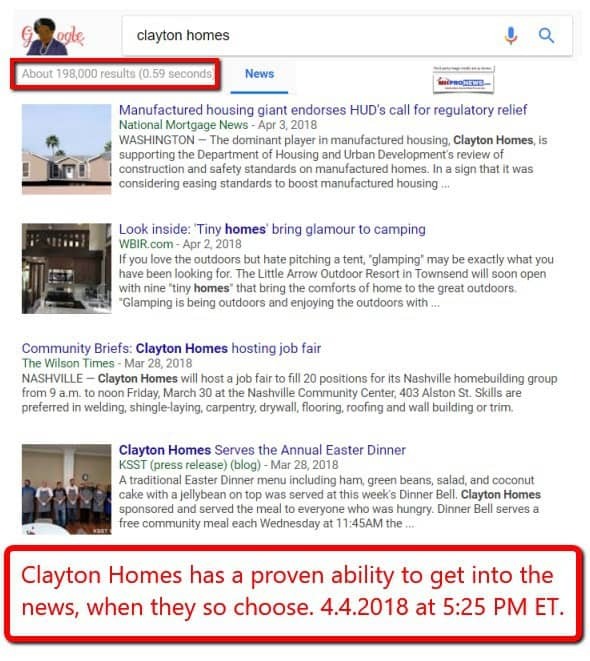 That said, why doesn’t Clayton routinely go after each and every example of mistakes made in the mainstream media about manufactured homes? Let’s rephrase for total clarity. • Berkshire Hathaway owns a press release service. • Berkshire Hathaway owns numerous media outlets. • As one of the nation’s largest home builders, Clayton could correct each and every example of mistaken reports in the media. • Clayton has their own communications and marketing people. 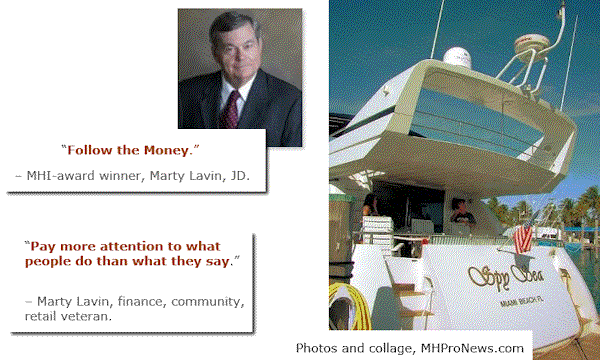 • The Manufactured Housing Institute (MHI) also have public relations (media) professionals. For years, the MHI executive committee has included 2 of the 4 seats held by Berkshire Hathaway, plus years of Tim Williams, President and CEO of 21st Mortgage as MHI Chairman. The other 2 of 4 the executive committee seats had ties to Berkshire Hathaway too. 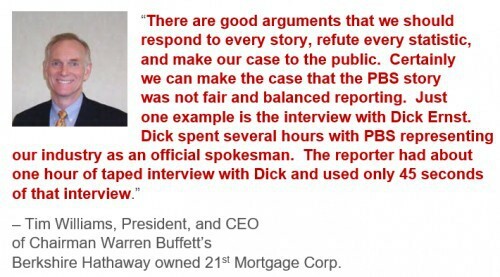 Clayton, MHI and Berkshire Hathaway can comment on – or correct the record on – any misleading, mistaken, bad terminology – – anything! – – associated with the industry. Will anyone seriously question that claim? Please, send me a response that explains this topic in some other logical fashion. Given that premise, that Clayton/MHI could correct any or every flawed media report, how about this question. Why don’t they do so? Why does Clayton and MHI allow poor terminology about manufactured homes to continue to go unaddressed? 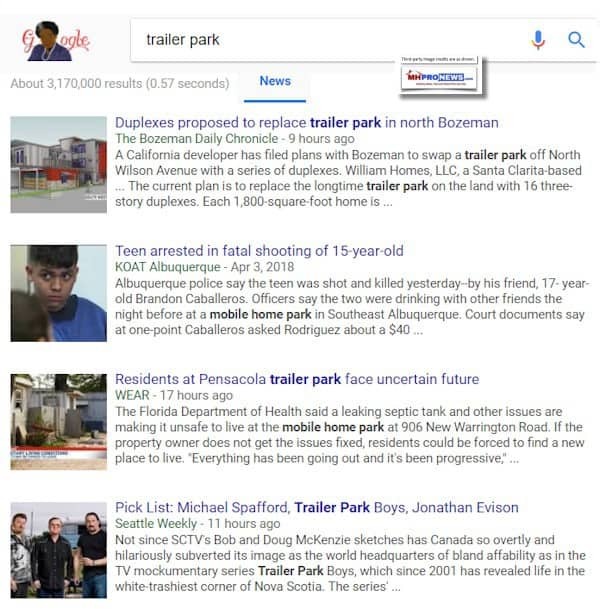 For example, why do they allow the media to call a manufactured home community a “trailer park?” [sic]. Why do they allow any bad information to go unaddressed? These are just some ‘trailer park’ [SIC} news stories this week. This happens week after week, year after year. Given that no one I’ve ever met aspired to be ‘trailer trash,’ can you see why this terrible terminology needs to be tackled? Where is Clayton and MHI on this or other negative media related issues? In interview and discussions with home owners and professionals, concerns about being stigmatized by the term “trailer trash” ranks high. It’s a reason millennials have given for not even considering a “mobile homes” – manufactured homes – as an option (see related reports, linked below). Image and misleading information directly or indirectly costs the industry hundreds of thousands of new home sales per year. That’s billions in sales a year. Why doesn’t Clayton and MHI go aggressively after that improper media reporting and terminology issue? Not with more lame advertorials, which industry statistics prove beyond a doubt failed to move the needle for the industry. Darren Krolewski, Co-President at MHVillage, DataComp. I asked Darren Krolewski during the Tunica Show why the millions who watch a classy Clayton video, or who visit Clayton’s or MH Village’s websites aren’t buying more homes? Krolewski said publicly and privately, he doesn’t have a good answer. We do. A big factor can be summed up with improper information and image. Pretty pictures and videos alone will not fix this. What will? We know this from experience in the field with clients. Correcting the record, time after time, lifts the industry’s shoppers from interest to buyers. Now I happen to believe that Warren Buffett, and Kevin Clayton are intelligent people. Tim Williams said it himself. There’s a good case to be made for correcting the record each and every time. Sir Arthur Conan Doyle, famous for the Sherlock Holmes detective stories, famously observed that when you eliminate the possibilities, whatever remains must be the truth. Kevin Clayton said over 6 years ago that they were “ready” then to do an image/public relations campaign. They can get in the news when they want to do so. Why don’t they fix this? As a state association executive told me today, MHI has a full time media person that could make that routine outreach whenever negative, inaccurate news hits. Warren Buffett said he likes a bargain. Buffett also commands his company presidents to expand their “moat” year after year. By keeping the industry’s image problematic, it obviously keeps new manufactured home sales at a lower level than it would otherwise be. That in turn arguably hurts every other business of every size engaged in manufactured housing in America. That means that other factories, retailers, etc. can be purchased cheaper than they otherwise would be. It also means that their market share can grow, until the day comes that they take their foot off the brake peddle. Isn’t this stating the obvious? That’s the reality check. They can get in the news. They can correct poor reporting, every time, if they wanted to do so. Clayton and MHI are not responsible for every piece of bad news that hits the media each and every week. 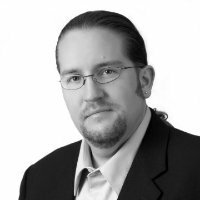 But they are 100 percent able – and thus, responsible – for not doing all that they can to fix bad reports when they occur. Those MHI “image” videos and advertorials are clearly ineffective. The only thing those videos and advertorials do is give them a fig leaf when they are questioned about the topic of image, media engagement, marketing, public relations, and education. The facts don’t lie. MHI has admitted at times that the industry is still performing at historically low levels. Why? Isn’t poor public perception, fueled by problematic and flawed media reports part of the problem? Then why doesn’t Clayton and MHI address each and every flawed report? Former MHI Chair Tim Williams admitted that it is a valid approach. Then whey not do it? Their failure to do so is part of what keeps the industry suppressed. It logically keeps the prices paid for buying the factories and retail centers of others lower than they otherwise would be. 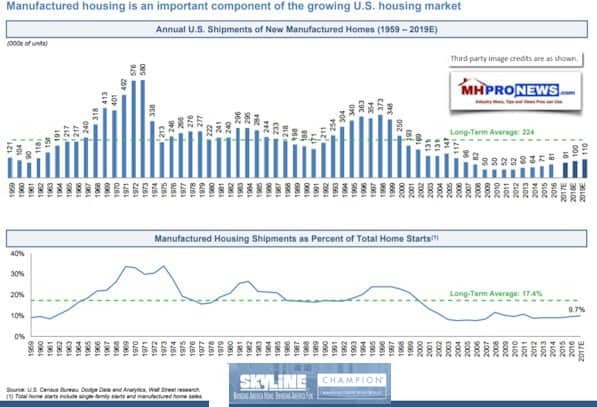 We can call this an allegation that manufactured housing is struggling due to the apparent failure of Clayton, Berkshire Hathaway and MHI to act. Or we could say the obvious. They have the resources. They know the need. Tim Williams admitted the logic of correcting the record in writing to MHProNews. The level of acceptance of manufactured housing is directly tied to this issue. Others like financing also have Clayton, Berkshire and MHI finger prints on them as to why they are unresolved (see related reports for details).